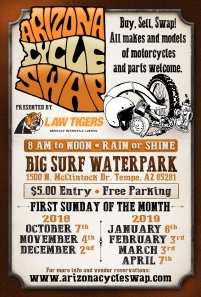 Motorcycle Events - Arizona Cycle Swap! All makes and models of motorcycles and parts welcome! Rain or shine, we still swap! Please note: there is no McClintock Dr. exit when traveling westbound on the 202. For online info www.azcycleswap.com and to register for vending space. Vendor set up and is from 7:00am to 8:00am. Only the vendors riding in the paying vehicle will be allowed in at this time. One vehicle is allowed per vendor space. Due to traffic flow, we cannot allow drop offs or load-ins from multiple vehicles. If you are purchasing a spot with your buddies, be sure to load all parts into one vehicle prior to arriving at the swap. If you are selling a motorcycle you will need to purchase a single vehicle vendor space. Single Vehicle spaces are 27'x18' and will accommodate 1 vehicle and your goods.